a deck of trivia playing cards with questions and answers about the year. We even have a greeting card from the year! The dimensions of the basket are 11 and 1/2" in length, and 8 and 1/2" in width. many of the 9 gifts inside are flat. Shrinkwrapped in a bamboo gift basket. On the outside of the basket, we can personalize the card envelope with a 50 character message for an additional charge of $5.00. Makes a wonderful 50th wedding anniversary gift!. Note: Items in basket may be arranged differently than shown in the picture for shipping purposes. What WE say about our 50th gift basket: People sometimes ask us about what the difference is between our two baskets. 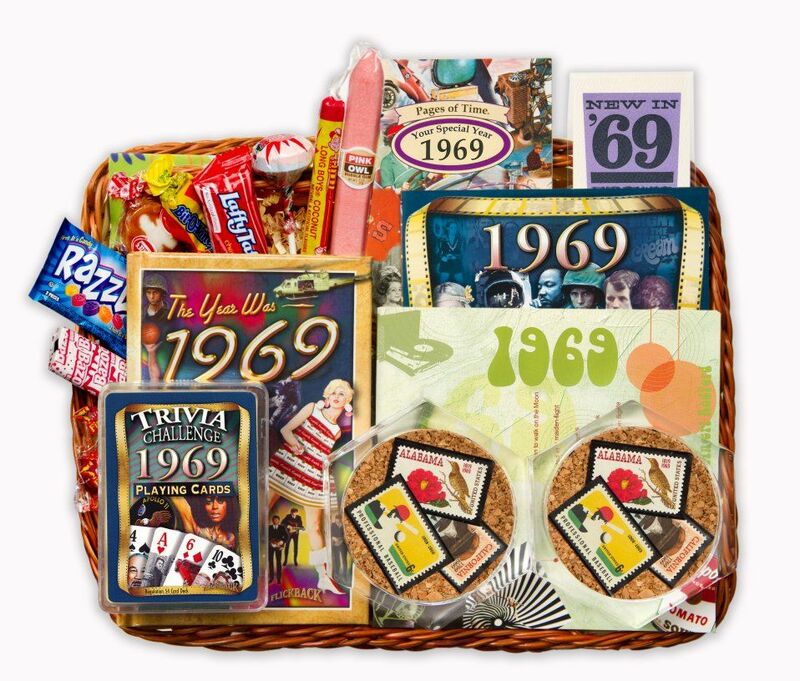 If you like the idea of a gift basket but want to give stamps instead, this 50th gift basket might fit the bill for you. Instead of including the coins from that year, we have included the stamps from the year they were married inside an attractive clear set of two coasters which they can use daily for their beverages or underneath a nice glass of wine. Everything else about the two baskets is identical- you still get the same CD, DVD, candy, frame and everything else inside the basket. As with our other gift basket, you can also decide whether you'd like to personalize the gold seal for a small extra price with your own short note to the couple. It was great to give a 50th wedding anniversary gift that was not a cookie cutter kind of thing. The couple we gave this to really enjoyed the unique nature of the gift. All positive feedback from the Recipients - they loved the CD and the book brought back so much. The gift was delivered much earlier than I expected. Thank you for putting together a fun gift basket for such a special event. Parents were thrilled with this eclectic collection of memorabilia from the year year they were married. They especially enjoyed the candies that are hard to find now. I was thrilled to find something other than flowers or food gift box. This is just the neatest anniversary Gift one could give to a special couple. My good friends were truly ecstatic over this gift! Hats off to the Senior Store for this amazing gift! Thanks! Bought this and had it sent to my parents for their 50th anniversary....we are celebrating at a later date by meeting in Mexico but I really wanted something for them to open on their actual big day! This was perfect and they are enjoying reminiscing about 1962! It's a fun, unique gift idea that would be appropriate for anyone celebrating a 50th. I was also impressed with customer service and they timed the shipping/arrival perfectly! They loved all, I thought it was a little small in size for the price. But in all pleased. Thank you! SeniorStore.com's comment: Thanks for the input! 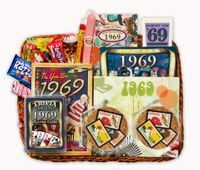 Physically, the basket measures 11.5" long, and 8.5" wide, but it contains 9 different year themed gifts inside the basket. Many of the items are flat, like the DVDs, CDs, ec. but it is an excellent value when you total up the retail value of these items individually. Hope that helps explain.